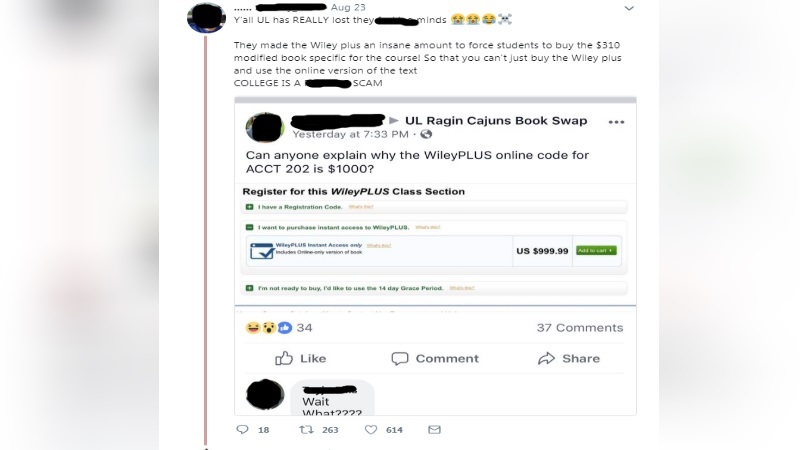 LAFAYETTE - Some students at the University of Louisiana-Lafayette are upset about the price of an online textbook. The school is charging $1,000 for the online book and access code for an accounting class. Angry students vented their frustrations on social media, and the post has since gone viral across the state. The post was originally made on the UL Ragin' Cajuns Book Swap page. Then it was re-posted on Twitter by a user who called college a "scam." “The publisher, after conversations with the Department of Accounting, set the online price at nearly $1,000 to discourage students from choosing to buy materials directly from its website. They believed it was best for the students to use a printed textbook since many of the materials in the book are needed for homework and classroom instruction," the statement read in part. The university said it was not aware of any students having bought the online version of the textbook as of Monday. Anyone who did is encouraged to contact the college of Business Administration.